As I mentioned in the 2011 Review (below), I was in the process of preparing another CD-ROM release: a study of the old 'octave style' anglo-concertina playing and the 'house dance' music it supported, up to around 1920. This is now finished. MTCD251 is a Digital Book with embedded audio files, by Dan Worrall - a well-respected authority on the Anglo concertina. Includes more than 150 photos and graphics, and more than 200 sound files in MP3 format. Australia: Dooley Chapman, George Bennett, Con Klippel, Jim Harrison, Charlie Ordish, Fred Holland, Clem O'Neal, Susan Colley, Ernie James, Percy Yarnold. Ireland: Musicians of the house dance repertoire: Mary Ann Carolan, Ella Mae O'Dwyer, Katey Hourican, Stack Ryan, Jim Droney, Martin Howley. Musicians of the céilí dance era: Elizabeth Crotty, William Mullaly, Michael Doyle, Patrick Flanagan, Tom Barry. England: William Kimber, Scan Tester, Ellis Marshall, Fred Kilroy, Eric Holland, Bill Link. South Africa: Faan Harris, Chris Chomse, Kerrie Bornman, Hans Bodenstein, Willie Palm, Pietie Prinsloo, Silver de Lange. Modern players in the old style: Australia: Ian Simpson, Ray Simpson, Keith Klippel, Peter Ellis, Dave de Hugard. England: Will Duke, Dave Prebble, Harry Scurfield. Ireland: Sean O'Dwyer. South Africa: Stephaan van Zyl. The fine looking feller on the cover is Albert George ‘Dooley’ Chapman (1892-1982), of Dunedoo, New South Wales, Australia, and his playing makes him fit to stand beside Scan Tester in my judgement. Here he is, playing an Untitled Polka, with a piano accompaniment provided by his daughter. It's available now from the MT Records wesite: www.mtrecords.co.uk/mt_rec.htm Price £12.00. Once again the CD-ROM containing the entire output of the magazine, from the articles in its first paper publications in 1983 right up to the 31st December 2011 for the Internet version, is now available - priced, as usual, just £10. Yup - 29 years for a tenner! And as you will see from the accompanying cover shot, this is Volume 13 ... and things have grown a little in those 13 years: MT now contains 268 main Articles, 68 shorter Enthusiasms articles, around 950 Reviews, 43 pages of News & Comment, 28 Letters pages, a huge Links directory, 3,350 photos and over 1,630 sound clips; plus loads of other things like Obituaries; Mondegreens; Sessions; Picture pages, Discographies ... the list goes on and on. Again, I've included a copy of the Real Alternative media player, since a number of readers have had problems with the 'proper' RealPlayer no longer working with the Version 3 RealAudio sound files we use. It works very well - but you need to uninstall the RealPlayer plug-in first. Be aware, though, that all new sound clips in the magazine will be in the MP3 file format. I've also included a compendium of all the Editorial pieces from 2000 to the present - since they give a good idea of the sorts of things which have concerned us over the years. 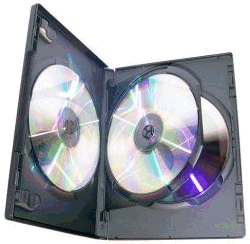 For anyone who's not tried it before, the CD-ROM is a really good way of having all the half a Gigabyte of the magazine instantly to hand, with no ISP charges and no waiting for downloads - a very pleasant user experience. Everything is presented as Web pages, exactly the same as on the Net - so you already have all the software required, and you know how to navigate to what you want. Just pop a tenner in the post to me, or go to the MT Records website if you want to use a Credit/Debit Card, and yours will be on its way to you the same day. You know it makes sense! I say 'finally' because it's actually been ready for some time - but (as with the Walter Pardon double CD back in 2000), it was agreed to be released concurrently with the Topic Records CD of Sarah (also an MT production). This was delayed so that the first tranche of Topic's new Voice of the People series could all be released at the same time (early 2012, I'm told). In the end, I was asked to launch the MT 3-CD Set at the Tommy Makem Singing Weekend in Armagh in October - and Topic agreed to this if I kept the release 'a bit quiet'. That's why there hasn't been a big fuss about it in MT yet. 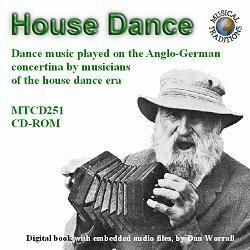 I'm also in the process of preparing another CD-ROM release: a study of the old 'octave style' anglo-concertina playing and the 'house dance' music it supported, up to around 1920. This project is written by Dan Worrall, and contains 132 photos and graphics, and 180 MP3 sound files from England, Ireland, Australia and South Africa. It should be ready in early 2012. So that makes a total of 9 CDs and two CD-ROMs this year! On the magazine front, things have been somewhat quieter compared with 2010, which saw the publication of an astonishing 40 new Articles. This year it's been just 8 new Articles - but there is another big one about Alfred Williams almost ready. There also have been some substantial additions to the Enthusiasms, Letters and News pages, and 40 new Reviews. Congratulations to all those hard working writers. Musical Traditions has now been in existence (in paper and virtual forms) for 29 years, and it's pleasing to note that our efforts are still reaching quite a number of people - the website had over 1.7 million visitors in 2011. Onwards! Once again, I'll remind you that Musical Traditions Internet Magazine exists to share our love of traditional music and musicians; if you have something to say about any traditional activity with a musical content, from anywhere in the world, please send it to me - the contact information is at the foot of the page. So - in hopes of an even more active 2012, and in spite of all the cuts - may I wish you all a Merry Christmas and a very Happy New Year. The 2007 Brazil Family 3-CD Set (MTCD345-7) and the new Sarah Makem 3-CD Set (MTCD353-5) have been presented, together with their booklets, in a 3-disc DVD case. I have been dissatisfied with the quality of these cases for some time, but have been unable to find anything better - apart from the Amaray case which is grey, not black, and extremely expensive. But my regular blank disc supplier, River Pro Audio, have now come up with a good alternative at a more affordable price - picture on right. The only 'problem' is that this case requires that the booklet has to be taken out of the case before the first of the CDs can be removed. Given that I hope that most purchasers would wish to actually read the booklet in the first instance, I don't really consider this to be too much of a problem. It will certaily be a nice change from having to send replacement cases to customers with broken ones. If any reader knows of a better quality 3-CD case of the same design that I used before, and at a reasonable price (less than 40p. ), I'd be pleased to hear about them. 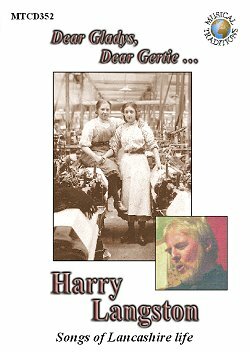 Musical Traditions Records' fifth CD release of 2011: Harry Langston: Dear Gladys, Dear Gertie ... (MTCD352) is now available. This CD is, I must freely admit, a bit of a surprise to find on the Musical Traditions Records label. A set of texts, few older than the 20th century, all with known authors, set to tunes composed during the last couple of decades by a known composer, who also sings them! But I promise you - if you like traditional English songs - you will absolutely love everything you hear on this CD. Wonderful, colourful, often passionate lyrics, coupled with some of the most glorious tunes you'll have heard for years. Added to that the fact that Harry Langston is a terrific singer who has fully overcome the 'curse' of a beautiful voice. The Booklet Notes to the CD appear as an Article in these pages, so you can check out the sound clips there, if you don't believe me! Harry wrote all the tunes to these songs himself, and also wrote the words to the song Accrington Pals. We have been fortunate to have had Harry as a regular at the Stroud singing sessions for many years, and I'm delighted to be able to share our good fortune wilth you. Buy this splendid CD from the MT Records website, only £12.00. I wonder what else they sang? Mediation is a word we encounter quite a lot these days - in our context it means selecting songs or tunes to suit an intended audience. That doesn't sound too bad - not like the old days, when Sharp et al deliberately changed words and arranged the songs for the middle-class drawing room, with piano-forte accompaniment! Whilst it's possible to understand their motivations, it's also apparent that much which they actually heard back then has been effectively lost to us for ever. But by the time that most of the sound recordings of traditional performers were made, collectors had realised their predecessors' mistakes - and the recordings made it possible to hear exactly what was sung or played. Or did they? Because almost everyone, amateur or professional, made their own decisions about what to actually record, and what to ignore, of their informants' repertoires. Moreover, a number of collectors can be quoted as saying, approximately: "S/he soon realised what sort of songs I was interested in, and thereafter only offered them for recording." Then, when record companies began issuing these recordings, they also made decisions about which items of those that the collectors offered them would make a suitable, and saleable, LP or CD ... products which rarely exceeded 45 minutes duration! Thus, the question at the head of this piece ... how much did we know of what else the traditional singers actually sang, when there had been so much selection and mediation along the way? When I published the first MT CD of Bob Hart, back in 1998, I had access to about 60 recordings of him, and it seemed a shame to omit any of them, so I made it a double CD - mainly because I was fond of Bob and liked his singing! Only later did I realise that it was really rather important to include as much as possible of a performer's recorded work - and avoid the mediation which had been the usual practice of record producers up to that point. All further MT releases continued this practice - to include all (or as much as was reasonably practicable) of a performer's recorded repertoire. I believe that only this approach affords the performers the proper respect they are rightfully due. The reason behind this little outburst is that MT Records have just released a CD of a Shropshire singer named Bill Smith. 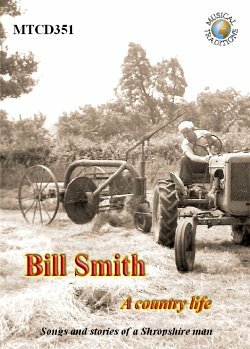 Bill was a farm worker (and briefly a farmer in his own right), and a contemporary of Fred Jordan. Bill's son, Andrew, decided to record him in the late-1970s. Andrew wasn't a song collector, and didn't choose what to record and what to omit - he just recorded what Bill remembered: songs, recitations, stories, jokes ... The mediation of past collectors and record producers is clearly demonstrated by the fact that Steve Roud had to allocate no fewer than 21 new Roud numbers for items you'll find on this CD. This makes this CD perhaps the only available example of the completely unmediated repertoire of an ordinary countryman, from the centre of England, in the middle of the 20th century. I think that this fact makes Bill Smith: a country life (MTCD351) one of the most important CDs we have ever produced! I hope you will agree. Norma and Martin would like to thank everybody for their wonderful good wishes, cards and flowers; these certainly lit up Norma's continued stay in hospital, especially when she regained consciousness, and reminded Martin of how the folk community loves and values her. Also thanks for the substantial financial contributions which you all made, making it possible for Martin to stay by Norma's bedside for almost the entire time she was there. This lengthy stay was, by the way, a stark reminder of the selfless dedication of ALL those nurses in all the hospitals, and especially those in the ICU in Warrington. We would both like also to thank Rod and Danny who - entirely unbidden - took on the task of co-ordinating the fund raising for our benefit - No, don't delete this bit Rod (or Danny). You are true friends. We also would like to express our thanks for the letters of condolence which were sent on the death of Michael. He was full of life almost up to the end. We shall miss him, as I am sure will all the folk community. Rod and Danny would like to add that their co-ordination of the fundraising activities was actually the idea of another friend, and that several events had already been planned by the time we put up this page. We have been astonished by the generosity of Norma's friends, raising a very substantial sum and enabling Martin to spend as much time as he needed to at Norma's side. Now we know what we had always supposed: that Norma is not just the best female singer on the English scene, but also the most loved; and just how lucky we all are to be a part of such a community of kind, generous and loving people. A couple of years ago I had an email form a reader who was having problems with RealPlayer - who I advised to try the free RealPlayer Alternative - Google will find it for you. I explained that when I started MT, back in 1996, my readers had nothing but a slow dial-up connection, so I looked for the best possible sound playing system which was acceptable in these circumstances - and RealAudio was it. By the time that broadband became widely available there were already some 900 RealAudio soundclips on the site, and in most cases I had no way of re-doing them as MP3s. Also, another of my objections was that using MP3 soundclips pops up Windows Media Player, obscuring what you're trying to read! However, since the announcement of the provision of high-speed broadband throughout the country (and the discovery that Bampton has it already!) I think that a reconsideration of MP3 is probably in order. This has also been prompted by a contributor telling me about the Google inline MP3 player - which gives the reader a very complete control over the playing of the soundclip, and doesn't obscure the text. A slight problem is that a recent version of Adobe's Flash Player needs to be installed - but I guess that most readers will already be so equipped. using Fred Whiting playing his Old Time Polka, from his new CD on MT Records (see below). Please let me know if there are any problems with using this player, as I've already used it in a couple of reviews, and am intending to do so for all new soundclips in the magazine.